The dealer must hit until the cards total 17 or more points. (At many tables the dealer also hits on a "soft" 17, i.e. a hand containing an ace and one or more other cards totaling six.) Players win by not busting and having a total higher than the dealer's. The dealer loses by busting or having a lesser hand than the player who has not busted. If the player and dealer have the same total, this is called a "push", and the player typically does not win or lose money on that hand. Blackjack's precursor was twenty-one, a game of unknown origin. The first written reference is found in a book by the Spanish author Miguel de Cervantes, most famous for writing Don Quixote. Cervantes was a gambler, and the main characters of his tale "Rinconete y Cortadillo", from Novelas Ejemplares, are a couple of cheats working in Seville. They are proficient at cheating at ventiuna (Spanish for twenty-one), and state that the object of the game is to reach 21 points without going over and that the ace values 1 or 11. The game is played with the Spanish baraja deck, which lacks eights, nines and tens. This short story was written between 1601 and 1602, implying that ventiuna was played in Castilla since the beginning of the 17th century or earlier. Later references to this game are found in France and Spain. When twenty-one was introduced in the United States, gambling houses offered bonus payouts to stimulate players' interest. One such bonus was a ten-to-one payout if the player's hand consisted of the ace of spades and a black jack (either the jack of clubs or the jack of spades). This hand was called a "blackjack", and the name stuck to the game even though the ten-to-one bonus was soon withdrawn. In the modern game, a blackjack refers to any hand of an ace plus a ten or face card regardless of suits or colours. At a casino blackjack table, the dealer faces five to seven playing positions from behind a semicircular table. Between one and eight standard 52-card decks are shuffled together. At the beginning of each round, up to three players can place their bets in the "betting box" at each position in play. That is, there could be up to three players at each position at a table in jurisdictions that allow back betting. The player whose bet is at the front of the betting box is deemed to have control over the position, and the dealer will consult the controlling player for playing decisions regarding the hand; the other players of that box are said to "play behind". Any player is usually allowed to control or bet in as many boxes as desired at a single table, but it is prohibited for an individual to play on more than one table at a time or to place multiple bets within a single box. In many U.S. casinos, however, players are limited to playing two or three positions at a table and often only one person is allowed to bet on each position. The dealer deals cards from his/her left (the position on the dealer's far left is often referred to as "first base") to his/her far right ("third base"). Each box is dealt an initial hand of two cards visible to the people playing on it, and often to any other players. The dealer's hand receives its first card face up, and in "hole card" games immediately receives its second card face down (the hole card), which the dealer peeks at but does not reveal unless it makes the dealer's hand a blackjack. Hole card games are sometimes played on tables with a small mirror or electronic sensor that is used to peek securely at the hole card. In European casinos, "no hole card" games are prevalent; the dealer's second card is neither drawn nor consulted until the players have all played their hands. Cards are dealt either from one or two handheld decks, from a dealer's shoe, or from a shuffling machine. Single cards are dealt to each wagered-on position clockwise from the dealer's left, followed by a single card to the dealer, followed by an additional card to each of the positions in play. The players' initial cards may be dealt face up or face down (more common in single-deck games). The players' object is to win money by creating card totals that turn out to be higher than the dealer's hand but do not exceed 21 ("busting"/"breaking"), or alternatively by allowing the dealer to take additional cards until he/she busts. On their turn, players must choose whether to "hit" (take a card), "stand" (end their turn), "double" (double wager, take a single card and finish), "split" (if the two cards have the same value, separate them to make two hands) or "surrender" (give up a half-bet and retire from the game). Number cards count as their natural value; the jack, queen, and king (also known as "face cards" or "pictures") count as 10; aces are valued as either 1 or 11 according to the player's choice. If the hand value exceeds 21 points, it busts, and all bets on it are immediately forfeit. 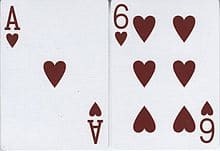 After all boxes have finished playing, the dealer's hand is resolved by drawing cards until the hand busts or achieves a value of 17 or higher (a dealer total of 17 including an ace, or "soft 17", must be drawn to in some games and must stand in others). The dealer never doubles, splits, or surrenders. If the dealer busts, all remaining player hands win. If the dealer does not bust, each remaining bet wins if its hand is higher than the dealer's, and loses if it is lower. In the case of a tied score, known as "push" or "standoff", bets are normally returned without adjustment; however, a blackjack beats any hand that is not a blackjack, even one with a value of 21. An outcome of blackjack vs. blackjack results in a push. Wins are paid out at 1:1, or equal to the wager, except for winning blackjacks, which are traditionally paid at 3:2 (meaning the player receives three dollars for every two bet), or one-and-a-half times the wager. Many casinos today pay blackjacks at less than 3:2 at some tables; for instance, single-deck blackjack tables often pay 6:5 for a blackjack instead of 3:2. Blackjack games almost always provide a side bet called insurance, which may be played when dealer's upcard is an ace. Additional side bets, such as "Dealer Match" which pays when the player's cards match the dealer's up card, are sometimes available. After receiving an initial two cards, the player has up to four standard options: "hit", "stand", "double down", or "split". Each option has a corresponding hand signal. Some games give the player a fifth option, "surrender". Stand: Take no more cards, also known as "stand pat", "stick", or "stay". Double down: The player is allowed to increase the initial bet by up to 100% in exchange for committing to stand after receiving exactly one more card. The additional bet is placed in the betting box next to the original bet. Some games do not permit the player to increase the bet by amounts other than 100%. Non-controlling players may double their wager or decline to do so, but they are bound by the controlling player's decision to take only one card. Split: If the first two cards of a hand have the same value, the player can split them into two hands, by moving a second bet equal to the first into an area outside the betting box. The dealer separates the two cards and draws an additional card on each, placing one bet with each hand. The player then plays out the two separate hands in turn; except for a few restrictions, the hands are treated as independent new hands, with the player winning or losing their wager separately for each hand. 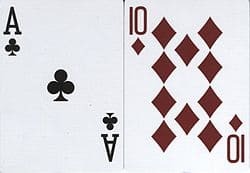 Occasionally, in the case of ten-valued cards, some casinos allow splitting only when the cards have the identical ranks; for instance, a hand of 10-10 may be split, but not one of 10-king. However, usually all 10-value cards are treated the same. Doubling and further splitting of post-split hands may be restricted, and blackjacks after a split are counted as non-blackjack 21 when comparing against the dealer's hand. Hitting split aces is usually not allowed. Non-controlling players may follow the controlling player by putting down an additional bet or decline to do so, instead associating their existing wager with one of the two post-split hands. In that case they must choose which hand to play behind before the second cards are drawn. Some casinos do not give non-controlling players this option, and require that the wager of a player not electing to split remains with the first of the two post-split hands. Surrender (only available as first decision of a hand): Some games offer the option to "surrender", usually in hole-card games and directly after the dealer has checked for blackjack (but see below for variations). When the player surrenders, the house takes half the player's bet and returns the other half to the player; this terminates the player's interest in the hand. Signal: The request to surrender is made verbally, there being no standard hand signal. Hand signals are used to assist the "eye in the sky", a person or video camera located above the table and sometimes concealed behind one-way glass. The eye in the sky usually makes a video recording of the table, which helps in resolving disputes and identifying dealer mistakes, and is also used to protect the casino against dealers who steal chips or players who cheat. The recording can further be used to identify advantage players whose activities, while legal, make them undesirable customers. In the event of a disagreement between a player's hand signals and their words, the hand signal takes precedence. Each hand may normally "hit" as many times as desired so long as the total is not above hard 20. On reaching 21 (including soft 21), the hand is normally required to stand; busting is an irrevocable loss and the players' wagers are immediately forfeited to the house. After a bust or a stand, play proceeds to the next hand clockwise around the table. When the last hand has finished being played, the dealer reveals the hole card, and stands or draws further cards according to the rules of the game for dealer drawing. When the outcome of the dealer's hand is established, any hands with bets remaining on the table are resolved (usually in counterclockwise order): bets on losing hands are forfeited, the bet on a push is left on the table, and winners are paid out. If the dealer's upcard is an ace, the player is offered the option of taking "insurance" before the dealer checks the hole card. Insurance is a side bet that the dealer has blackjack and is treated independently of the main wager. It pays 2:1 (meaning that the player receives two dollars for every dollar bet) and is available when the dealer's exposed card is an ace. The idea is that the dealer's second card has a fairly high probability (nearly one-third) to be ten-valued, giving the dealer blackjack and disappointment for the player. It is attractive (although not necessarily wise) for the player to insure against the possibility of a dealer blackjack by making a maximum "insurance" bet, in which case the "insurance proceeds" will make up for the concomitant loss on the original bet. The player may add up to half the value of their original bet to the insurance and these extra chips are placed on a portion of the table usually marked "Insurance pays 2 to 1". Players with a blackjack may also take insurance, and in taking maximum insurance they commit themselves to winning an amount exactly equal to their main wager, regardless of the dealer's outcome. Fully insuring a blackjack against blackjack is thus referred to as "taking even money", and paid out immediately, before the dealer's hand is resolved; the players do not need to place more chips for the insurance wager. Insurance bets are expected to lose money in the long run, because the dealer is likely to have blackjack less than one-third of the time. However the insurance outcome is strongly anti-correlated with that of the main wager, and if the player's priority is to reduce variation, they might choose to pay for this. Bets to insure against blackjack are slightly less likely to be advantageous than insurance bets in general, since the ten in the player's blackjack makes it less likely that the dealer has blackjack too. As with all casino games, blackjack incorporates a "house edge", a statistical advantage for the casino that is built into the game. The advantage of the dealer's position in blackjack relative to the player comes from the fact that if the player busts, the player loses, regardless of whether the dealer subsequently busts. Nonetheless, blackjack players using basic strategy will lose less than 1% of their total wagered amount with strictly average luck; this is very favorable to the player compared to other casino games. The loss rate of players who deviate from basic strategy through ignorance is generally expected to be greater. A "soft 17" in blackjack. An ace and any combination of 6. Under the "Reno rule", double down is only permitted on hard totals of 9, 10, or 11 (under a similar European rule, only 10 or 11). Basic strategy would otherwise call for some doubling down with hard 9 and soft 13-18, and advanced players can identify situations where doubling on soft 19-20 and hard 8,7 and even 6 is advantageous. The Reno rule prevents the player from taking advantage of double down in these situations and thereby increases the player's expected loss. The Reno rule increases the house edge by around one in 1000, and its European version by around two in 1000. Each blackjack game has a basic strategy, which is playing a hand of any total value against any dealer's up-card, which loses the least money to the house in the long term. The bulk of basic strategy is common to all blackjack games, with most rule variations calling for changes in only a few situations. For example, if the above game used the hit on soft 17 rule, common in Las Vegas Strip casinos, only 6 cells of the table would need to be changed: double on 11 vs. A, surrender 15 or 17 vs. A, double on A,7 vs. 2, double on A,8 vs. 6, surrender (if not allowed, then hit) on 8,8 vs. A. Also when playing basic strategy never take insurance or "even money." It makes the player's 12 a worse hand to stand on (since the only way to avoid losing is for the dealer to go bust, which is less likely if there are fewer 10s left in the shoe). Players can make larger bets when they have an advantage. For example, the players can increase the starting bet if there are many aces and tens left in the deck, in the hope of hitting a blackjack. Players can deviate from basic strategy according to the composition of their undealt cards. For example, with many tens left in the deck, players might double down in more situations since there is a better chance of getting a good hand. A card counting system assigns a point score to each rank of card (e.g., 1 point for 2-6, 0 points for 7-9 and −1 point for 10-A). When a card is exposed, a counter adds the score of that card to a running total, the 'count'. A card counter uses this count to make betting and playing decisions according to a table which they have learned. The count starts at 0 for a freshly shuffled deck for "balanced" counting systems. Unbalanced counts are often started at a value which depends on the number of decks used in the game. Blackjack's house edge is usually between 0.5%-1% when players use basic strategy. Card counting can give the player an edge of up to 2% over the house. Card counting is most rewarding near the end of a complete shoe when as few as possible cards remain. Single-deck games are therefore particularly susceptible to card counting. As a result, casinos are more likely to insist that players do not reveal their cards to one another in single-deck games. In games with more decks of cards, casinos limit penetration by ending the shoe and reshuffling when one or more decks remain undealt. Casinos also sometimes use a shuffling machine to reintroduce the exhausted cards every time a deck has been played. Card counting is legal and is not considered cheating as long as the counter isn't using an external device, but if a casino realizes a player is counting, the casino might inform them that they are no longer welcome to play blackjack, Sometimes a casino might ban a card counter from the property. Techniques other than card counting can swing the advantage of casino blackjack toward the player. All such techniques are based on the value of the cards to the player and the casino as originally conceived by Edward O. Thorp. One technique, mainly applicable in multi-deck games, involves tracking groups of cards (also known as slugs, clumps, or packs) during the play of the shoe, following them through the shuffle, and then playing and betting accordingly when those cards come into play from the new shoe. Shuffle tracking requires excellent eyesight and powers of visual estimation but is more difficult to detect since the player's actions are largely unrelated to the composition of the cards in the shoe. Arnold Snyder's articles in Blackjack Forum magazine brought shuffle tracking to the general public. His book, The Shuffle Tracker's Cookbook, mathematically analyzed the player edge available from shuffle tracking based on the actual size of the tracked slug. Jerry L. Patterson also developed and published a shuffle-tracking method for tracking favorable clumps of cards and cutting them into play and tracking unfavorable clumps of cards and cutting them out of play. The player can also gain an advantage by identifying cards from distinctive wear markings on their backs, or by hole carding (observing during the dealing process the front of a card dealt face down). These methods are generally legal although their status in particular jurisdictions may vary. The side wager is typically placed in a designated area next to the box for the main wager. A player wishing to wager on a side bet is usually required to place a wager on blackjack. Some games require that the blackjack wager should equal or exceed any side bet wager. A non-controlling player of a blackjack hand is usually permitted to place a side bet regardless of whether the controlling player does so. The house edge for side bets is generally far higher than for the blackjack game itself. Nonetheless side bets can be susceptible to card counting. A side count, designed specifically for a particular side bet, can improve the player edge. Most side games do not offer a sufficient win rate to justify the effort of advantage play; exceptions include "Lucky ladies" and "Over/Under". Blackjack can be played in tournament form. Players start with an equal numbers of chips; the goal is to finish among the top chip-holders. Depending on the number of competitors, tournaments may be held over several rounds, with one or two players qualifying from each table after a set number of deals to meet the qualifiers from the other tables in the next round. Another tournament format, Elimination Blackjack, drops the lowest-stacked player from the table at pre-determined points in the tournament. Good strategy for blackjack tournaments can differ from non-tournament strategy because of the added dimension of choosing the amount to be wagered. As in poker tournaments, players pay the casino an initial entry fee to participate in a tournament, and re-buys are sometimes permitted. Some casinos, as well as general betting outlets, provide blackjack among a selection of casino-style games at electronic consoles. Video blackjack game rules are generally more favorable to the house; e.g., paying out only even money for winning blackjacks. Video and online blackjack games deal each coup from a fresh shoe, rendering card counting much less effective. Spanish 21 provides players with many liberal blackjack rules, such as doubling down any number of cards (with the option to rescue, or surrender only one wager to the house), payout bonuses for five or more card 21s, 6-7-8 21s, 7-7-7 21s, late surrender, and player blackjacks always winning and player 21s always winning, at the cost of having no 10 cards in the deck (though there are jacks, queens, and kings). An unlicensed version of Spanish 21 played without a hole card is found in Australian casinos under the name "Pontoon" (presumably borrowed from the British recreational blackjack-like game "Pontoon" which has substantially different rules). 21st-Century Blackjack (also known as "Vegas Style" Blackjack) is found in California card rooms. In this form of the game, a player bust does not always result in an automatic loss; depending on the casino, the player can still push if the dealer busts as well, although the dealer typically has to bust with a higher total. Double Exposure Blackjack deals the first two cards of the dealer hand face up. Blackjacks pay even money, and players lose on ties. Double Attack Blackjack has very liberal blackjack rules and the option of increasing one's wager after seeing the dealer's up card. This game is dealt from a Spanish shoe, and blackjacks only pay even money. Blackjack Switch is played over two hands whose second cards the player is allowed to interchange. For example, if the player is dealt 10-6 and 5-10, then the player can switch two cards to make hands of 10-10 and 6-5. Natural blackjacks are paid 1:1 instead of the standard 3:2, and a dealer 22 is a push. Multiple Action Blackjack involves a player placing between 2 or 3 bets on a single hand. The dealer then gets a hand for each bet the player places on a hand. This essentially doubles the number of hands a single dealer can play per hour. Splitting and doubling are still allowed, but often limited due to limited space on the felt for additional chips. Strategy for this game is the same as strategy for conventional blackjack regardless of how many places are bet. Super Fun 21 allows a player to split a hand up to four times. If the player has six cards totaling 20, he automatically wins. Wins are paid 1:1. Gambit was a game show with Wink Martindale where couples answer questions to collect cards that could add up to 21. Catch 21 is a game show with Alfonso Ribeiro from The Fresh Prince of Bel-Air. On this show, three players answer questions to earn cards in order to win cash and ties are not allowed. In 2002, professional gamblers around the world were invited to nominate great blackjack players for admission into the Blackjack Hall of Fame. Seven members were inducted in 2002, with new people inducted every year after. The Hall of Fame is at the Barona Casino in San Diego. Members include Edward O. Thorp, author of the 1960s book Beat the Dealer which proved that the game could be beaten with a combination of basic strategy and card counting; Ken Uston, who popularized the concept of team play; Arnold Snyder, author and editor of the Blackjack Forum trade journal; Stanford Wong, author and popularizer of the "Wonging" technique of only playing at a positive count, and several others. Novels have been written around blackjack and the claimed possibility of winning it methodically. Among these were 'The Blackjack Hijack' (Charles Einstein, 1976), later played as a TV movie Nowhere to Run (1978 film), Bringing Down the House (Ben Mezrich), also filmed as Twenty-one (1991 film) and again 17 years later in the 21 (2008 film), an almost identical theme was shown in the Canadian 2004 film The Last Casino. Movies titled "21" or Twenty One, depicting the blackjack game as a central theme have been produced and released in 1918 (starring Bryant Washburn) and in 1923 (starring Richard Barthelmess). In 'The Hangover', an American produced comedy, four friends try to follow the instructions in "Beat the Dealer" by Edward Thorp, but get drunk and forget what they had achieved or not. In Rain Man, Raymond (Dustin Hoffman), an autistic savant is able to win at blackjack by counting cards, a central part of the plot.